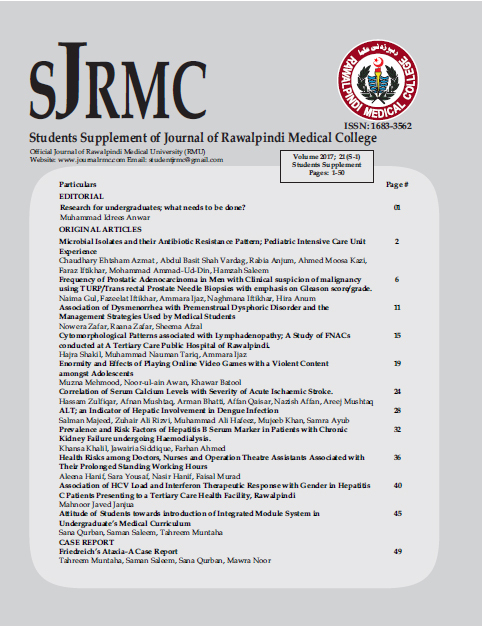 Background: The objective of the study was to evaluate the frequency of dysmenorrhea, its association with PMDD and various lifestyle factors, and the management strategies adopted by female medical students of Rawalpindi Medical University. Methods: A cross sectional study was conducted on 380 female students aged 18-25 years, with regular cycles and no diagnosed uterine/extra uterine disorder. Data were collected about age, BMI, age of menarche, duration of menstrual flow, severity of pain, associated symptoms, interference with daily activities and the management strategies adopted. Results: 56.3% of the respondents had dysmenorrhea. Mean values were; for age of study population= 20.39±1.55, for BMI=20.87±3.25, for age of menarche=12.93. 79.4% had primary and 20.6% had secondary dysmenorrhea. 69.6% of those with dysmenorrhea had duration of flow between 4-6 days. 47.14% reported their pain from 4-6 on Wong Baker FACES Pain Rating Scale. Pain increased in 39.7%, settled in 37.4% and decreased in 22.9%. 34.6% reported the first day of menstruation to be painful. 27.6% of the total, and 40.2% of respondents with dysmenorrhea presented with PMDD (p=0.00). A statistically significant association of dysmenorrhea was found with fatigue (p=0.00) while none was observed with junk food consumption (p=0.836), water usage (p=0.924) and daily level of activity (p=0.094). Common management strategies were pain killers (59.3%), warm fluids (42.5%), eggs (39.3%), hot-water bottles (26.6%) and heating pads (15%). Conclusion: Dysmenorrhea is quite a usual finding in majority of the female students. A statistically significant association is found with fatigue and PMDD, in contrast to that with junk food eating and bathing. Dysmenorrhea influences life significantly and thus requires appropriate management.